What does a transformed life actually look like? In his follow-up to the critically acclaimed Imaginary Jesus, Matt Mikalatos tackles this question in an entertaining and thought-provoking way—with MONSTERS!!! While Christians claim to experience Christ’s resurrection power, we sometimes act like werewolves who can’t control our base desires. Or zombies, experiencing a resurrection that is 90 percent shambling death and 10 percent life. Or vampires, satiating ourselves at the expense of others. But through it all we long to stop being monsters and become truly human—the way Christ intended. We just can’t seem to figure out how. 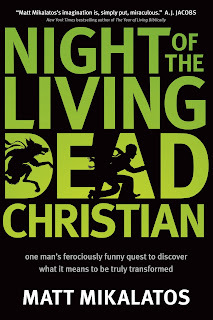 Night of the Living Dead Christian* is the story of Luther, a werewolf on the run, whose inner beast has driven him dangerously close to losing everything that matters. Desperate to conquer his dark side, Luther joins forces with Matt to find someone who can help. Yet their time is running out. A powerful and mysterious man is on their trail, determined to kill the wolf at all costs . . .
By turns hilarious and heartbreaking, Night of the Living Dead Christian is a spiritual allegory that boldly explores the monstrous underpinnings of our nature and tackles head-on the question of how we can ever hope to become truly transformed. 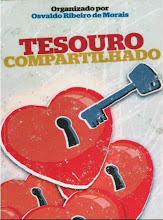 Officially, this is the blog's first post in English. I have to try, right? Hmmm. 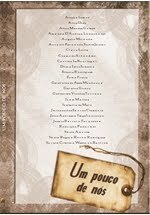 Especially because I wrote about Imaginary Jesus in portuguese and the author checked it out even though he doesn't speak (or reads it for that matter) portuguese. That's my way to say thank you, Matt. I don't know if it's a coincidence or not, but the state of Washington is full of, uh, different creatures, don't you think. Isn't there a small town called Forks in Washington? "I'm pretty sure I heard something. I mean I heard THAT!" So that's how it starts at least on the horror movies. There's always someone brave enough to go outside and investigate. Really, I'm safer under the bed than outdoors duh! Unless the house got mice, spiders and roaches, ugh! But then if you got all that under your bed that speaks a lot about you, just saying. I guess I read a lot of Stephen King when I was younger because I would never ever go out in the middle of the night all by myself like this guy in the book. Outside he finds a mad scientist, a robot, a werewolf, a bunch of zombies, a vampire (at least this one doesn't glow on the sunshine) and lots of other weird creatures, people and situations. Now he has to help Luther, the werewolf, to conquer his inner beast somehow... But how? I have to mention here that Luther isn't the only one going through such a hard time. Did you know that you and me are monsters too? Or at least we have these monsters within us. Oh, come on, don't give your computer that look. And don't pretend you have no idea what I'm talking about. You know, that monster of ours that we try to curb and control all the time and then... kabum, it goes out of control. Is it possible to kill our monster and be set free of our dark side? Can we really live a transformed life in a crazy world?